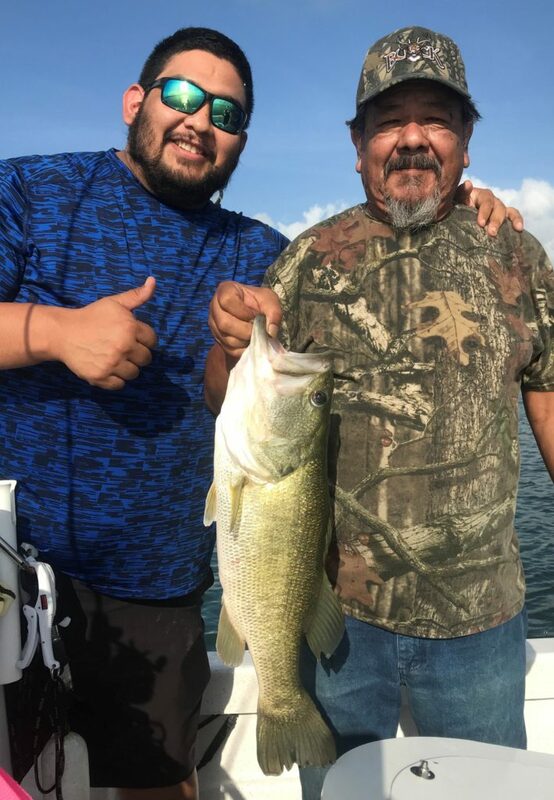 WHO I FISHED WITH: This morning, Wednesday, 13 June, I fished with Daniel Gonzalez, his father, Fred Gonzalez, and Daniel’s girlfriend, April Krawczyk. Although a native of Belton, Daniel now resides in Reno, NV, as does April. The two flew in through Killeen for a week’s stay in Belton to celebrate Fred’s 70th birthday (tomorrow). 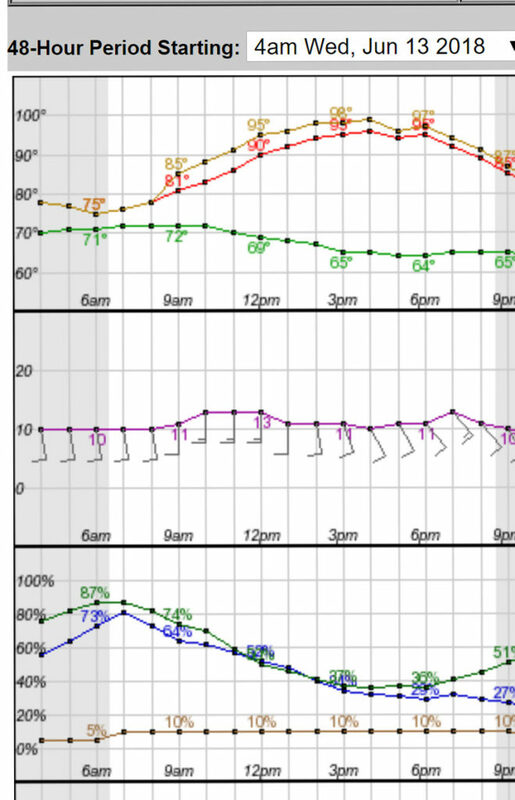 Those celebration plans included today’s trip on Stillhouse. It was only fitting that the the birthday boy caught the biggest fish of the trip this morning. The largemouth Fred is holding weighed 6.00 pounds on a certified scale. 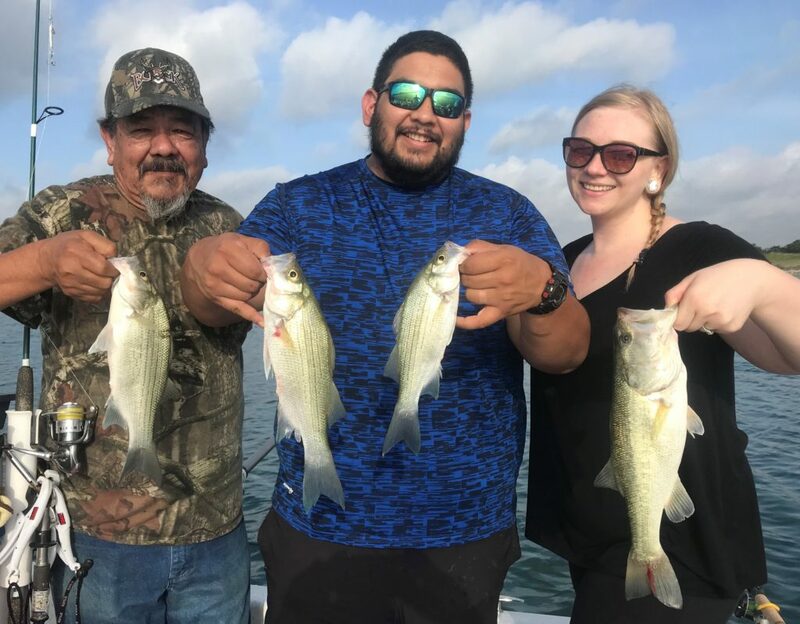 Everyone caught plenty of fish this morning and April officially lost her rookie status as she learned to downrig, vertical jig with slabs, work tailspinners, and fish with live bait. From left, that’s Fred, Daniel, and April. WHAT WE FISHED FOR: This was a multi-species trip in which we caught white bass, largemouth bass, & freshwater drum. WHEN WE FISHED: Wednesday morning, 13 June.